A huge Christian cross on public land in Maryland is massively disrespectful to nonreligious Americans, the Freedom From Religion Foundation and four other secular groups are contending before the U.S. Supreme Court. The friend of the court brief in support of the American Humanist Association’s case before the Supreme Court was filed yesterday by FFRF, the Center for Inquiry, American Atheists, Military Association of Atheists & Freethinkers, and the Secular Coalition for America. The Supreme Court will be holding oral arguments on Feb. 27 in the challenge of a major 4th U.S. Circuit Court of Appeals victory that the American Humanist Association obtained in October 2017. The appeals court affirmed that a mega-cross, which was erected as a war memorial in Bladensburg, Md., is unconstitutional. It held that the 40-foot-tall cross “excessively entangles the government in religion” because the cross is the “core symbol of Christianity” and “breaches” the constitutional wall dividing state and church. The petitioners challenging this ruling are the Maryland National Capital Park and Planning Commission and the American Legion. The Supreme Court needs to keep in mind the rights and sensibilities of the large disbelieving portion of the U.S. population while making its decision, the secular groups urge in their joint amicus brief. As secular and humanist organizations that promote freedom of conscience for those who do not practice religion, the groups’ brief offers a unique viewpoint on government display of religious symbols and the exclusion of religious minorities and nonbelievers. Today, between one-fourth and one-third of Americans identify as religiously unaffiliated. The government’s use of prominent religious symbols serves to stigmatize, marginalize and diminish that large portion of citizens who exercise their constitutional right not to believe or practice a religion. These same trends are present in the U.S. military. In 2017, more than 30 percent of the active duty population of the American military did not affiliate with any religion. The five secular groups note that those soldiers risk their lives to defend our country. So, when we purport to honor them, why would we do so in a manner that disrespects their nonbelief? “The ‘First Amendment mandates governmental neutrality between religion and religion, and between religion and nonreligion,’” to quote the U.S. Supreme Court, the brief observes. The brief asks the court to imagine if the shoe were on the other foot: A Christian who takes for granted being surrounded by Latin crosses and other Christian symbols might well think twice about seeing an Islamic crescent or Wiccan pentangle or Atheist atom on a prominent government building, display or monument, especially one purporting to honor the sacrifice of those with different religious views. A religious minority or nonbeliever feels the same way when the symbol is a large and prominent Latin cross. And that feeling of exclusion is even more salient for those who, unlike Christians, are part of a religious minority already confronting stigma, disfavor and discrimination in many aspects of public life. For instance, almost half of all Americans “would be unhappy if a family member were to marry someone who doesn’t believe in God,” according to the Pew Research Center. When deciding whether the Establishment Clause permits the government to use the Latin cross to collectively honor fallen soldiers, the historical practices of the U.S. military reveal that the military has scrupulously avoided using sectarian symbols, such as Latin crosses, to mark the graves of soldiers who practice a different religion. Nobody would argue that the government could decide to use a Latin cross to mark the headstone of each and every veteran buried at Arlington. In Bladensburg, purporting to memorialize all soldiers through a symbol of only some soldiers’ religion has the same effect. 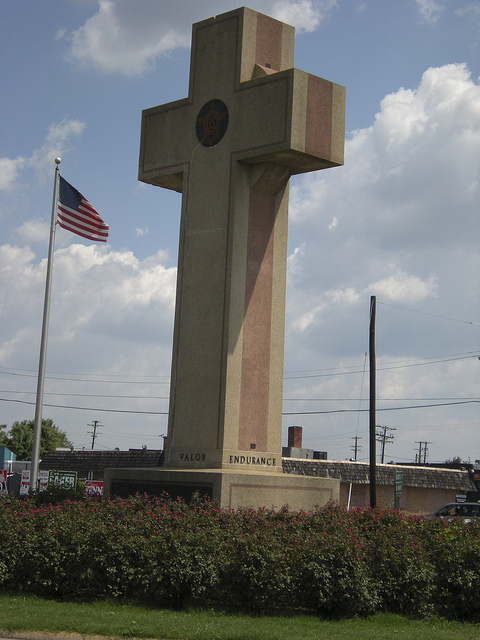 “The military’s history and practice reflect that the reasonable outside observer would treat a government display of a prominent Latin cross, purporting to collectively memorializing war heroes, as an endorsement of Christianity and as stigmatizing and marginalizing non-Christians,” the secular groups contend. “This understanding requires no logical leap: a Latin cross is unmistakably ‘the preeminent symbol of Christianity,’” to quote the U.S. Supreme Court. The U.S. solicitor general and others are asking the Supreme Court to disregard the harm to nonbelievers from the government’s use and promotion of Christian symbols, arguing that there cannot be an Establishment Clause violation without a showing of coercion. Establishment Clause principles have long prevented government from stigmatizing nonbelievers. And those principles are particularly salient today, because tens of millions of Americans — and counting — identify with no religion. In yoking patriotism and sacrifice to Christianity — and Christianity alone — the Bladensburg memorial inflicts injury on millions of vulnerable Americans who are not affiliated with any religion — including American soldiers risking their lives to defend their country. That’s why FFRF and four other like-minded organizations are urging the U.S. Supreme Court to uphold the ruling of the 4th U.S. Court of Appeals. A judgment to the contrary would dishonor the innumerable soldiers without belief who have fought and died for our nation. The Freedom From Religion Foundation has two main purposes: to educate about nontheism and to preserve the cherished constitutional principle of separation between religion and government. It currently has 31,900 U.S. members. The Center for Inquiry is a nonprofit organization devoted to promoting reason, science, critical thinking and humanist values. American Atheists is a national civil rights organization that works to achieve religious equality for all Americans by protecting what Thomas Jefferson called the “wall of separation” between government and religion created by the First Amendment. The Military Association of Atheists & Freethinkers builds community for atheists and humanists in the military. The Secular Coalition for America is a national nonprofit advocacy organization dedicated to amplifying the diverse and growing voice of the nontheistic community in the United States. The Freedom From Religion Foundation thanks the law firms of Orrick, Herrington & Sutcliffe and Clinton & Peed for crafting the brief.